I do not suggest that, upon drawing a poetical blank on the last Monday of National Poetry Month, you google "perfect poem." No, do not do that. Consider that advice my creatively wrapped gift to you. Results are alternately stultifying and embarrassing. Eventually, though, you'll get to one that reaches out and pulls you from the mire. Unsurprisingly it will be by Dorothy Parker . One perfect rose. That, of course, will center you. You will feel hope again for poetry and remember to link to a couple of other nice things you've found in the realm of verse. Aaryn Belfer did not find just a poem, she found a poetic experience and she shared it with the internet. Rob Rummel-Hudson is forever finding new and wonderful ways to describe and honor his fabulous daughter, Schuyler. This Langston Hughes poem is one of my favorite of his ways. Have you found any poems lately? 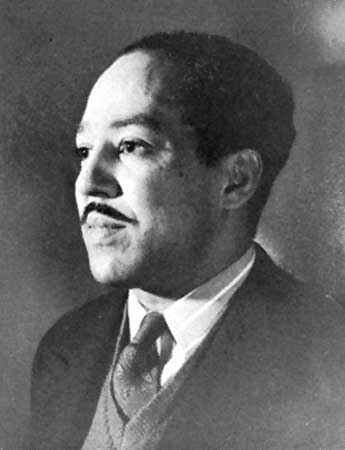 *Pictured: Langston Hughes, since we haven't had a photo of him yet this month.